We are very pleased to offer you the opportunity to invest in one these beautifully detailed and enduring collector’s edition bronzes by New Zealand artist Brian Moore. Born in Timaru, Brian grew up in Christchurch and has a great interest in the South Island and its rich history. He is an established professional artist of some 30 years standing, whose works have been presented to such notables as HRH Prince Philip, Sir Edmund Hillary and Sir Peter Blake. Well-known Alexandra identity Bill Tinker, Otago Goldpanning Champion, was keen to help Brian keep history alive with his artwork. He was originally photographed panning on the banks of the Clutha, for one of a series of pen & ink drawings on early days in New Zealand, which then inspired this detailed sculpture. You can see the fine balance, muscle tension and concentration as he searches for specks of colour in the bottom of the pan. Go to the web page: www.brianmoore.co.nz/gold for the background story and to see a slide show of views from various angles. 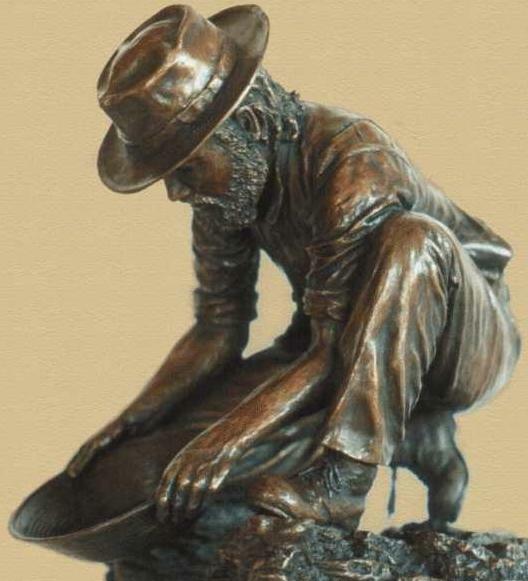 Bronzes are cast to order and take around eight weeks to go through the many foundry processes. Email: info@brianmoore.co.nz for installment options. or on our a secure on-line order form: https://sales.net.nz/brianmoore/index.htm .